Christian Huygens patented a pocket watch employing a spiral balance spring, lacking a fusee for equalizing the mainspring torque, implying Huygens thought that his spiral spring would isochronise the balance. J. Ferguson discovered asteroid #50 Virginia. J. Palisa discovered asteroid #251 Sophia. August Kopff discovered asteroids #650 Amalasuntha, #651 Antikleia and #3133 Sendai. G. Neujmin discovered asteroid #768 Struveana. K. Reinmuth discovered asteroid #939 Isberga. K. Reinmuth discovered asteroid #1072 Malva. Max Karl Ernst Ludwig Planck (23 April 1858 - 4 October 1947) was a German physicist who is considered to be the inventor of quantum theory. In 1899, he discovered a new fundamental constant, which is named Planck's constant, and is, for example, used to calculate the energy of a photon. Also that year, he described his own set of units of measurement based on fundamental physical constants. One year later, he discovered the law of heat radiation, which is named Planck's law of black body radiation. This law became the basis of quantum theory, which emerged ten years later in cooperation with Albert Einstein and Niels Bohr. P. Shajn discovered asteroid #2108 Otto Schmidt. USSR launched Sputnik 1 on an R-7 (ICBM) booster, the first man-made satellite to orbit the Earth. Sputnik 1 was the first artificial satellite successfully placed in orbit around the Earth. (The Russian word "Sputnik" means "companion," "satellite" in the astronomical sense.) In 1885, in his book "Dreams of Earth and Sky," Konstantin Tsiolkovsky had first described how such a satellite could be launched into a low altitude orbit. Coming at the height of the Cold War, the launch caught the West by surprise, and began the space race by galvanizing interest and action on the part of the American public to support an active role in space research, technology, and exploration. Sputnik 1 was launched on an R-7 (ICBM) booster from Baikonur Cosmodrome at Tyuratam (370 km southwest of the small town of Baikonur) in Kazakhstan, then part of the former Soviet Union, on 4 October 1957 at 10:28:04 pm, Moscow time. It was the first in a series of four satellites in the Soviet Sputnik program, a contribution to the International Geophysical Year (1957-1958). Three of these satellites (Sputnik 1, 2, and 3) reached Earth orbit. The Sputnik 1 satellite was a 58.0 cm (14.7 inches) diameter aluminum sphere that weighed 84 kg (184.3 lb) with four whip-like antennas that were 2.4-2.9 meters long. The antennas looked like long "whiskers" pointing to one side. The spacecraft obtained data pertaining to the density of the upper layers of the atmosphere and the propagation of radio signals in the ionosphere. The instruments and electric power sources were housed in a sealed capsule and included transmitters operated at 20.005 and 40.002 MHz (about 15 and 7.5 meters wavelength), the emissions taking place in alternating groups of 0.3 seconds duration. The downlink telemetry included data on temperatures inside and on the surface of the sphere. Since the sphere was filled with nitrogen under pressure, Sputnik 1 provided the first opportunity for meteoroid detection (no such events were reported), since losses in internal pressure due to meteoroid penetration of the outer surface would have been evident in the temperature data. The satellite transmitters operated for three weeks, until the on-board chemical batteries failed on 26 October 1957, and were monitored with intense interest around the world. The orbit of the then inactive satellite was later observed optically to decay 92 days after launch (4 January 1958), after having completed about 1400 orbits of the Earth over a cumulative distance traveled of 70 million kilometers. The orbital apogee declined from 947 km after launch to 600 km by 9 December. The Sputnik 1 booster rocket also reached Earth orbit and was visible from the ground at night as a first magnitude object, while the small but highly polished sphere, barely visible at sixth magnitude, was more difficult to follow optically. Several replicas of the Sputnik 1 satellite can be seen at museums in Russia and another is on display in the Smithsonian National Air and Space Museum in Washington, DC. British Overseas Airways Corporation (BOAC, now British Airways) began the first transatlantic passenger jet service with flights between London and New York City, but not yet with a daily schedule. USSR launched Luna 3 to the Moon, which returned the first images of the Lunar far side. NASA successfully launched Little Joe-6 (LJ-6) from Wallops Station, Virginia, carrying a boilerplate Mercury capsule with a dummy escape system on a ballistic flight for qualification of the launch vehicle structure and evaluation of command systems. The 100th launch of a Douglas Thor-based launch vehicle carried the Courier 1B active communications satellite to orbit, the first active repeater in space. The COURIER I-B active communications satellite, the first active repeater in space, was successfully placed into orbit by a Thor-Able-Star launch vehicle from Cape Canaveral, Florida, on 4 October 1960. After completing one orbit, it received and recorded a transcribed message to the United Nations by President Eisenhower, transmitted from Fort Monmouth, New Jersey, and retransmitted it to another Earth station in Puerto Rico. This marked the 100th launch of the Douglas Thor (combined military and scientific launches) and a Thor record of 60% of the US satellites boosted into orbit. Goethe Link Observatory discovered asteroid #1994 Shane. NASA and the USAF launched X-15A VO Stability Test mission # 42 with the with lower ventral off, in which Robert Rushworth reached a maximum speed of 4554 kph (Mach 4.30) and achieved a maximum altitude of 23.774 km. NASA and the USAF launched X-15A VO Stability Test mission # 71 in which Robert Rushworth reached a maximum speed of 5621 kph (Mach 5.17) and a maximum altitude of 34.199 km in a flight marred by failure of the APU, ball nose, and yaw damper. NASA launched Explorer 21 (IMP 2) into orbit from Cape Canaveral, Florida, for interplanetary and distant magnetospheric studies of energetic particles, cosmic rays, magnetic fields, and plasmas. Explorer 21 (IMP 2), a solar cell and chemical battery powered spacecraft, was launched 4 October 1965 into an orbit lower than was planned. IMP 2 was instrumented for interplanetary and distant magnetospheric studies of energetic particles, cosmic rays, magnetic fields, and plasmas. Each normal 81.9 second telemetry sequence consisted of 795 data bits. After every third normal sequence, there was an 81.9 second interval of rubidium vapor magnetometer analog data transmission. Initial spacecraft parameters included a local time of apogee at noon, a spin rate of 14.6 rpm, and a spin direction of 41.4 degrees right ascension and 47.4 degrees declination. The significant deviation of the spin rate and direction from the planned values and the achievement of an apogee of less than half the planned value adversely affected usefulness of the data. Otherwise, the spacecraft systems performed well, with nearly complete data transmission for the first 4 months and for the sixth month after launch. Data transmission was intermittent for other times, and the final transmission occurred on 13 October 1965. USSR launched Luna 7 from Baikonur, which was intended to achieve a soft landing on the Moon. However, due to premature retrofire and cutoff of the retrorockets, the spacecraft impacted the Lunar surface in the Sea of Storms. NASA and the USAF launched X-15A UV Plume/Solar/MM Technology/Meteor/Solar mission # 189 in which William Dana reached a maximum speed of 6272 kph (Mach 5.53), and achieved a maximum altitude of 76.535 km. USSR's Zond 5 L1 capsule was flown by An-12 from Bombay to Moscow, safely returning the biological payload after the first circumlunar Earth return mission. USSR's Lunokhod 1 (Luna 17) officially ceased operations. Luna 17 was launched 10 November 1970 to the Moon via an Earth parking orbit, and entered Lunar orbit on 15 November 1970. It soft landed on the Moon on 17 November 1970, in the Mare Imbrium (the Sea of Rains) region. The spacecraft had dual ramps by which the payload, Lunokhod 1 (an exploratory rover with eight independently powered wheels), descended to the Lunar surface. Lunokhod was powered by a solar cell array, and equipped with four television cameras and special extendable devices to impact the Lunar soil for soil density and mechanical property tests. An x-ray spectrometer, an x-ray telescope, cosmic-ray detectors, and a laser device were also included in the instrumentation package. The rover was intended to operate through three Lunar days but actually operated for eleven Lunar days (Earth months). The operations of Lunokhod officially ceased on 4 October 1971, the anniversary of Sputnik 1. By that time, Lunokhod had traveled 10.54 km, had transmitted more than 20,000 TV pictures, sent more than 200 TV panoramas, and had conducted more than 500 Lunar soil tests. L. Kohoutek discovered asteroid #3475. Purple Mountain Observatory discovered asteroids #2223 Sarpedon and #2363 Cebriones. C. Kowal discovered asteroid #2594; T. Smirnova discovered asteroid #3055. USSR launched the Progress 4 unmanned supply vessel from Baikonur to Salyut 6. USSR launched the Progress 4 unmanned supply vessel on 4 October 1978 to deliver fuel, consumable materials and equipment to the Salyut 6 space station. It docked with Salyut 6 on 6 Oct 1978 01:00:15 GMT, undocked on 24 Oct 1978 13:01:52 GMT, and was destroyed in reentry on 26 Oct 1978 16:28:13 GMT. Total free-flight time 4.22 days. Total docked time 18.50 days. L. G. Karachkina discovered asteroid #3623. 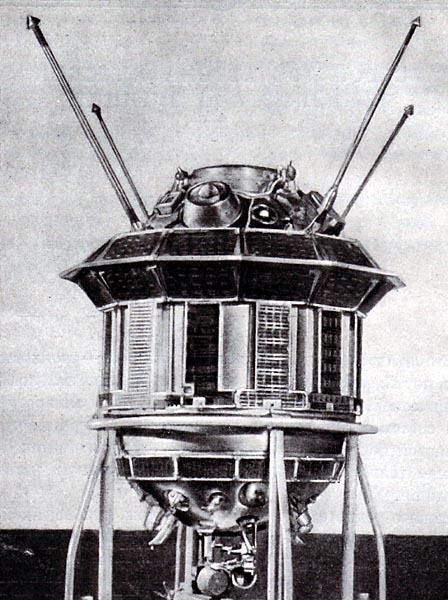 USSR launched the Foton 7 materials research satellite from Plesetsk, which also carried German and French experiments, in continuation of space materials research conducted jointly with Germany and France. Foton 7 returned to Earth on 20 October 1991. (Leroy) Gordon Cooper, Jr. (6 March 1927 - 4 October 2004) was an American astronaut. He was one of the original Mercury 7 pilots in the Mercury program, the first manned space effort by the United States. While stationed in Germany in the early 1950's, Cooper claims to have seen several unidentified flying objects (UFOs). He related his account on Art Bell's radio program, stating the objects were shaped "like saucers - they were metallic looking, but we couldn't really get close enough to see more than that. You couldn't see any wings on them." Cooper initially suspected the objects were Russian, but later speculated they could be "some kind of extraterrestrial vehicle." Cooper was a test pilot in the US Air Force before being selected as a Mercury astronaut in April 1959. He was launched into space on 15 May 1963 aboard Mercury-Atlas 9 (Faith 7), the last Mercury mission. He orbited the Earth 22 times and logged more time in space than all five previous Mercury astronauts combined in that flight, a mission which lasted 34 hours, 19 minutes and 49 seconds, the first time an American spent more than 24 hours in space. Cooper also gained the distinction of becoming the first American astronaut to sleep not only in orbit but on the launch pad during a countdown. Two years later, on 21 August 1965, Cooper flew as the commander of Gemini 5 on an eight-day mission with Charles Conrad. Cooper was the first person to make a second orbital flight. He was tentatively scheduled to fly in the Apollo program, but was scratched after a falling-out with NASA management. He retired from NASA and the Air Force on 31 July 1970 with the rank of colonel. Cooper wrote one book, Leap of Faith, which chronicled his experiences with the Air Force and NASA, as well as his efforts to expose an alleged UFO conspiracy. Cooper was the last American astronaut to orbit the Earth for an entire mission by himself, but not the last US astronaut to reach space alone: Two flights of the X-15 later in 1963 passed the 100 km "edge of space", and the Mojave Aerospace Ventures SpaceShipOne made three flights past that barrier. The third flight by the latter craft, in which it won the Ansari X Prize, occurred on 4 October 2004 - the same day that Cooper died of natural causes at age 77 in Ventura, California. Scaled Composites/Mojave Aerospace flew the Tier One SpaceShipOne Flight 17P - X-Prize Flight 2 mission to an altitude in excess of 100 km to capture the Ansari X Prize for the first civilian spacecraft to do so. Scaled Composites/Mojave Aerospace flew the Tier One SpaceShipOne Flight 17P - X-Prize Flight 2 mission on 4 October 2004, in which Burt Rutan's privately funded SpaceShipOne made its second flight within 2 weeks to an altitude in excess of 100 km (above the Karman Line) to capture the Ansari X Prize for the first civilian spacecraft to do so. The objectives of the flight were to win the Ansari X-Prize, and break the rocketplane altitude record set by Joe Walker in the X-15 in 1963 (354,200 feet). The Tier One (White Knight/SpaceShipOne) composite aircraft took off at 06:49 PDT. The rocketplane was dropped exactly one hour later at 14.4 km altitude. Pilot Brian Binnie fired the hybrid rocket motor for 83 seconds. The engine cut off with SpaceShipOne at Mach 3.09 (3524 kph) at 65 km altitude. From there it coasted to 111.996 km (367,442 feet, 69.6 miles) altitude. Binnie experienced weightlessness for 3.5 minutes before re-entry began. The spacecraft reached Mach 3.25 during re-entry and a peak deceleration of 5.4 G's at 32 km altitude. Binnie reconfigured the vehicle to a glider at 15.5 km and then made an 18 minute glide to a landing at Mojave airport. SpaceShipOne thereby won the $10 million X-Prize. No anomalies were noted on the flight and SpaceShipOne returned with no maintenance squawks.